This is a very elegant way to enjoy asparagus in season. It makes a lovely appetizer, or a nice salad. Clean the asparagus, cut the tough woody part of the stem off and slice as you would like to serve. Bring a pot of lightly salted water to boil and cook the asparagus al dente. Once the asparagus are cooked, drain and plunge into icy cold water to stop the cooking process. Allow the asparagus to cool. Slice into rounds and lightly heat the vegan hot dogs or sausages. Bring a small pot of water to boil add the rice vinegar. Clean the radishes, and slice very thinly. I used a mandolin. Cook the radish slices for 3-5 minutes then plunge into cold water. Make the mustard sauce by mixing the ingredients. You may need a splash of water to be able to blend the spread. Serve as a salad or appetizer. 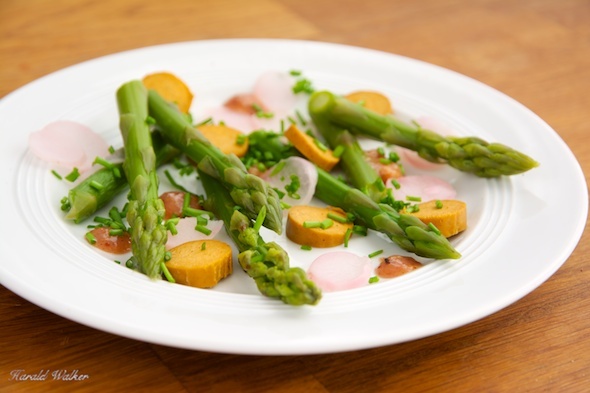 Arrange the asparagus pieces, vegan hot dog pieces and radish pieces on individual salad plates. Dot some of the mustard sauce around the plate to dip the hot dog pieces and asparagus in. Posted by Chris Walker on June 20, 2013 in Appetizers, Asparagus, Radish.